Leopold's Crate: Where's the poop! In a bag, because you're a good owner and you picked it up. Where's the poop! In a bag, because you're a good owner and you picked it up. If you're one of those lucky people who have enough land that your dog can go poop in the woods or field, and you can just leave it there without fear that you or someone else will step in it (or that your toddler will pick it up.... which happened to me not long ago...) then this post isn't for you. If, however, you're one of the many, many people who don't have that luxury, then let's talk poop! That's right, I'm blogging about picking up dog poop. I realize this is maybe an odd topic to discuss, but I just can't help but feel that I'm somewhat of an expert poop picker-upper considering the sheer number of poops I've bagged--and in different climes, too (which can make a difference!). I've even been praised for my poo-bag-tying abilities (thanks for noticing, Dad! :-D ). Basically, I've got the poo-grab down to a science and can knot a bag up with a flip of the wrist. Bingo, bango, bagged. This is probably one of the most common scenarios you'll run into. I've found there are two ways to handle the poo-grab when a poop is in grass. One, I push back the blades of grass as much as I can, because grabbing a stalk is a good way to make a mess of the whole grab because then the poop gets smeared on the grass and you either have to leave the poop grass (and pray the owner of the yard doesn't accidentally walk in the poo smear!) or somehow break off the poo-grass blades mid-pick-up and get it stuffed into your bag, which doesn't always work because if the grass is too long, it can flop around and risk getting poo on the outside of the bag or on your hand, a scenario that I've had happen, which was clearly a traumatic experience because it has caused me to write a horribly run-on sentence. The second option, then, is to purposefully grab the grass below the poop and pluck it as you're picking up the poop. I find that this method works well if the poop is too "embedded" in the grass. Which brings me to what husband and I refer to as "soft serve poop". You know what I'm talking about... When it's soft, but still forms a pile? These poos are tough. Probably the toughest to pick up aside from runny poops, which don't really have a chance of being picked up at all unless they've been deposited on leaves or debris or sand. But you do have a chance with the soft serve poop. Usually just one chance. You've got to get it right if you want to get it all. You may be temped to do a full-out grab, but that's a mistake! And usually results in a quite a bit of poo-smear residue (that I've seen my husband try to basically wipe into the ground... ha! He's adorable). The trick is to use a light touch and roll. Don't push down, because that causes the smear. Just grab as much as you can with a very light touch and gently roll the poo to the side and into your bag. If you get it right, you won't even be able to tell there was a poo there at all. If you can master this poo-grab, I recommend you add "dog-poop picker-upper expert" to your resume, because that's what you are. Blurt out "Crap!" (which functions as both an exclamation of discontent but also points out what is now on the ground), curse our dog's gastro system for having issues, attempt to pick up at least some of the poo--usually just so that any passers-by know we at least tried, and then walk away quickly from the scene of the crime and hope that no one notices the nasty poo we just left on the ground! And then we hurry home in case there is more runny poop on the way. If it has to be in someone's yard, it's only polite to have it it my own. Plus then I can wash it away with a hose if I want. This has got to be my favorite substrate from which to pick up poop. So EASY. And if it's a sloppy poop, all you do is pick up a little of whatever the substrate is around the poop and ta-da! Not a bit of poop left behind. A clean grab. When I lived in South Bend, IN, I would purposefully take Leopold for walks on routes that had areas like this, and I would encourage him to poop in those areas. We don't really have leafy or sandy or debris-y areas like that along our walking routes now here in South Texas... But it was nice while it lasted. When I lived in South Bend, we knew it was spring when we started to smell the malodorous stench drifting off the large piles of accumulated dog poop as they emerged from the melting snow. I can only assume that no one in South Bend knew how to pick up their dog's poop when it fell in snow and would instead just kick a bit of all-too convenient and abundant snow over top to hide it. Good thing I'm writing this post. And while it's going to be some time before I need to pick up another snow-poop, I have spent the majority of my life, so far, in areas with winters, so I've picked up my fair share of turds from the snow. I'll admit that snow-poop pick-ups were kind of hit or miss for me at first. If you just go for the turd, there's always a bit of brown left in the snow, which is just gross. To avoid leaving brown snow, I would often try to also grab a bit of the snow that was under and around the poop. Occasionally, though, I would misjudge and grab too much snow, making it hard to then close the bag. And then I'd have to compress the snow inside the bag, sort of like making a poo snowball, in order to get the bag tied shut. But in my opinion, better a poo snowball inside a bag than gigantic poo mounds on sidewalks and back alleys come springtime. I currently live in South Texas, where the sun is fierce. Around here the poops that my dogs leave in the yard bake in the sun so fast that I actually leave them on purpose (unless we're having company over or my kid is running around in the back yard! ), because a baked poop is infinitely easier to pick up than a freshy. Dog leaves a pile in the morning, and by the afternoon the poo has a hard exterior and is a breeze to pick up and leaves little, if any, residue. And if I miss a poo (it happens... even to me! ), by the time I find the pile, it's often petrified to the point that I have to look twice to tell if it's a poo or a light-colored rock. As a midwest girl at heart, I've been trying to find the bright side of living in South Texas; the sun's poo-baking abilities is certainly a benefit of being down here. If you pick up dog poop on a regular basis, you're bound to mess up the poo-grab at some point. If you end up with poo smears too far up the side of the bag, I recommend that you do NOT try to tie that bag shut. You will almost certainly end up squeezing the poop out and onto your hand. Again, this has happened to me. Instead, just toss the now-compromised bag onto the ground and try again with a second bag. I recommend grabbing the open side of the messy bag to make sure any errant poop ends up in the bottom of the second bag. Most dogs squat and deposit their poops in a nice, singular pile. However, some of us have a special breed of dog: the poop walker. Halo is such a dog. Sometimes she starts pooping before she stops walking, which results in a trail of turds. If you have a poop walker as well, just remember to back-track a bit and try to find all the offending nuggets. Just picked up some trash bits, now time to pick up a poop! I'm always pleased when my dogs decide to poop at the same time while on walks. It means I can use one bag for two poops! And saving bags saves money and resources. Helps offset the occasions when I mess up a grab and need to double bag....! A tip for cramming two piles in one bag: it sometimes helps to reposition your hand between poops in a way that sort of partially closes the bag around the first poop. Sometimes I even use two hands: one to secure the first poop in the bag and the second to grab the second poo. Otherwise, it's very probable that little poo nuggets will drop out as you're picking up the second poop, and then more will drop out when you go to pick up the firstly dropped poo nuggets, and so on and so on. Another way to use a bag for "double dooty" is to pick up some trash in the bag, also. We moved into our house about a year ago and are still finding little bits of pieces of plastic and who-knows-what in our yard (I think I've got it all and then more appears... I don't get it!). When I'm picking up poops in our yard, I keep an eye out for some pieces of garbage that I can pick up, too. This practice can also be applied to dog walk poops. Look for some litter on the ground, pick that up first, then pick up your dog's poo. It's just one small piece of trash, but could you imagine if everyone picked up one small piece of trash every time they picked up their dog's poop? I suppose that would require everyone to pick up their dog's poop... But that's another issue. And not one that applies to you, because now you know how to pick up every type of pile of poop in existence. ...Except runny poop. If you figure out how to do that, leave a comment with instructions, and know that you are a true poo-grab master! This is from my amateur comic strip "Living with Animals". I felt it was relevant. 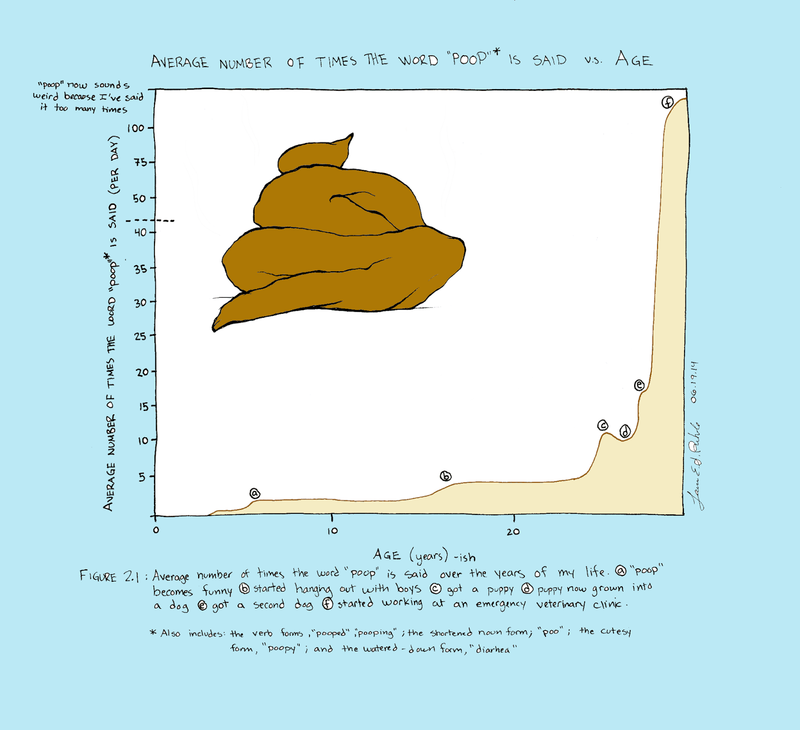 Though I should add an event: "(g) write a blog post on dog poop"; it would cause a rather large spike in the graph! Your comic needs to be updated with "had a baby" - because that also causes a very sharp increase!